Since school has started my house has become a hot-spot for USPS haha. I’ve been receiving my textbooks and makeup products in the mail. Some products you have already seen (The NYX and UD products), and now I’m going to show you and quickly review the rest. E.L.F. recently had a sale/promotion going on. They had a sale on mineral products, and coupon codes for free shipping and one for 10 free $1 products. I hope some of you took advantage of this! I highly recommend that you sign up for emails on E.L.F.’s website so that you can receive coupon codes if you have any interest in buying E.L.F. products. When you order from E.L.F. you can only use on coupon code per order so I chose the 10 free items. I got 4 makeup brushes, a silver/pewter makeup bag, a mascara primer, the lip plumper/primer duo, the brow gel/treatment duo, a cuticle treatment, a matte nail varnish, the zit zapper, a cheek tint, brow stencils, a cheek highlighter, a setting liquid, foundation, and they threw in a free lip gloss. Not much to say on these quite yet… The brushes are nice for the price although the blending brush sheds like crazy. It’s really frustrating because I wear contact lenses and the hairs stick to them and make me want to claw my eyes out. I’ve used the foundation once. My skin is tricky to match, I have more of a green tone and the foundations have a peachy/orange tone. Overall I like the formula it has a dewy finish but gets greasy looking fast so I have to powder it. I love the packaging. It looks really nice and almost high-end. I also love the fact that it has a pump! So instead of spilling the foundation out you can just pump what you need. The mascara primer is comparable to most drugstore primers. It’s a thinner formula than those that I’ve used so you have to wait for the coats to dry before applying more. Works really well but just takes a little longer than my other primers. The highlight must have separated in the mail. There’s a runny liquid that flows out and some product just sits. Try squishing the tube to mix it and apply it on your hand and mix before dabbing a tiny amount on your cheeks. I’ve just barely tested some of the actual products so I’ll review them once I actually have had a chance to use them. I also finally ordered some circle lenses from Pinky Paradise! Unfortunately, the New Adult Green lenses I had been LUSTING after were not available in prescription, so I had to look around for another pair. I ended up ordering Tsubasa’s Bambi series lenses in Apple Green. 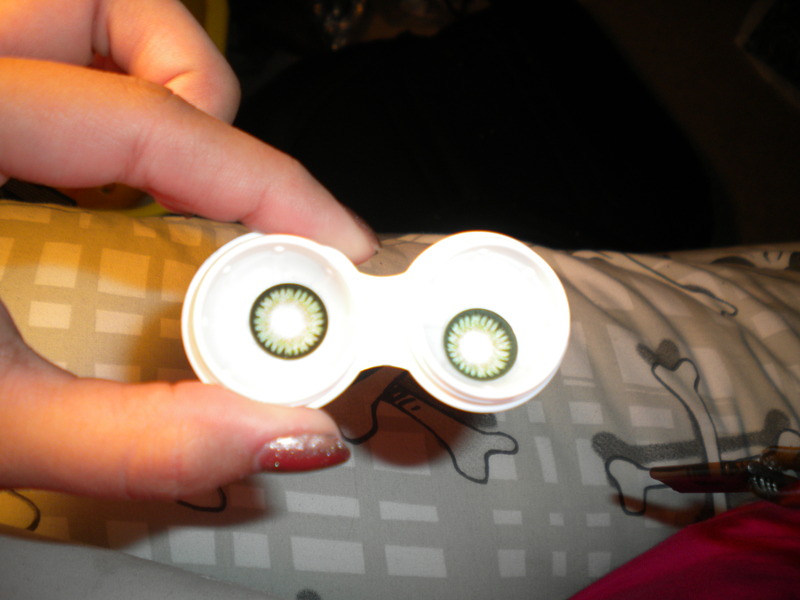 They’re a more natural green than the New Adult lenses but they are BEAUTIFUL. Here they are sitting in the case. Pinky Paradise also sent me a free case that is shaped like two cute green bears and one of those hair tools that has velcro on it to hold your hair back. The lenses really are lovely and have a natural, but noticeable enlarging effect. Unfortunately due to some strange mix-up they are not prescription. The bottles have my prescription written on them, but the lenses are plano…. it was really disappointing. I’m currently working with their customer service to get this resolved. Pinky Paradise honestly has some of the best customer service I’ve dealt with. They are always friendly and fast to respond. Hopefully this will get resolved soon and I’ll be able to write a review on these. Today’s post is about the various things I want in my life. Material things. These aren’t necessarily things I am going to buy on a whim, but maybe after a while of lusting after them I’ll splurge on a few. Now because I don’t actually own these items, the images and information provided about these items or products were found either on the manufacturers website or a seller’s website.